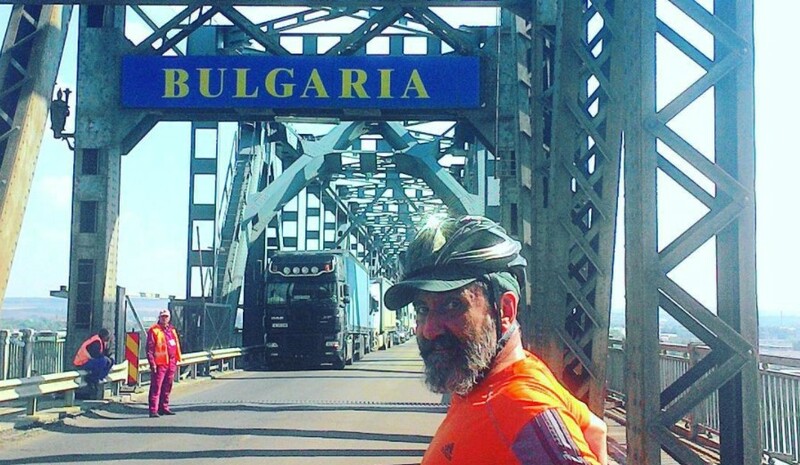 After a fabulous three weeks of Romanian hospitality, it was time to get back on the bikes and move on to Bulgaria. 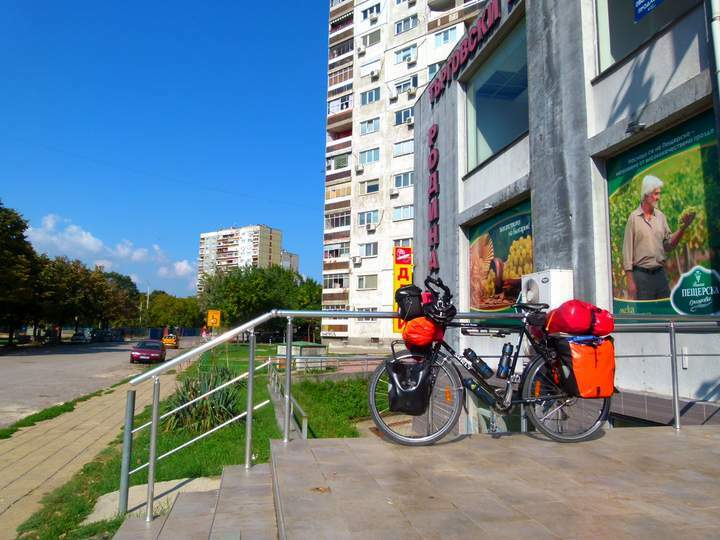 Our route from the heart of Bucharest to the Bulgarian border town of Ruse looked relatively straightforward, but it wasn’t to be without its challenges. The bridge crossing the mighty Danube at Ruse was under repair, but still open to traffic. Lots of traffic!! The resurfacing that was taking place was needed and well overdue. Riding in and out of the huge ruts gouged into the road took all of our concentration, especially with a convoy of heavy trucks bearing down on us from behind. With only one lane operating at a time and lengthy delays, patience was running thin. With no ability to turn up the pace due to road conditions, we were an obvious annoyance. 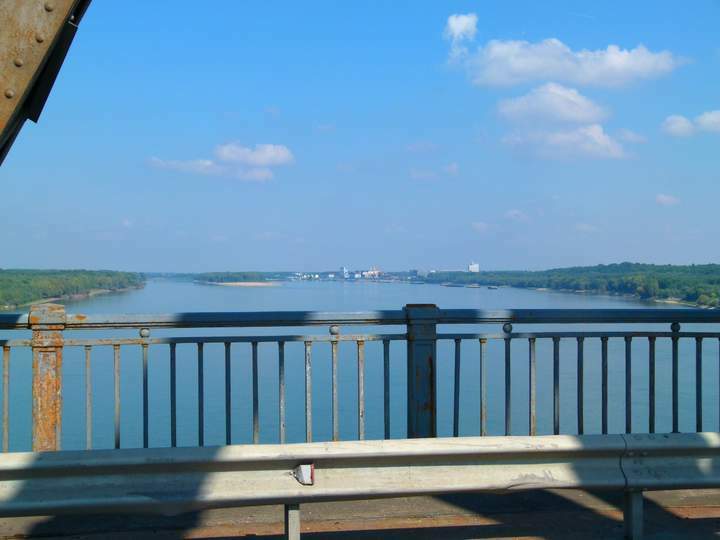 Crossing over the Danube from Romania (right) to Bulgaria (left). At one point we jumped the queue at the traffic lights on the Romanian side and made some good distance on the rest of the pack, only to find a bus coming from the Bulgarian side which had done the same thing! We had to frantically squeeze our fully-loaded bikes onto a tiny curb with only a skeletal, makeshift barrier to keep us from plunging over the side. About a foot wide, the space clearly wasn’t meant to be used, especially for anything our size. We gulped as we looked down over the 100m drop to the Danube while clutching a wobbly, rickety fence. As the oncoming juggernaut bore down, we sucked in our breath and hoped we’d done enough to avoid a collision. Seriously nauseating! The whole bridge shook and shuttered as it passed within a coat of paint from us. Anger wasn’t my first emotion; it was relief. Until that is, I looked back past the rocking fence post that I had hold of, and pictured us both plummeting, bikes and all, into the void. Then I was angry. Ran off a bridge by a bus, what an inglorious way to go! Ran off a bridge by a bus. What an inglorious way to go! On the other side, immigration formalities to get into Bulgaria were no fuss, and we headed up a few slight inclines to get into Ruse. We’d been told not to expect much but apart from the industrial area around the bridge, the city itself seemed OK. We cycled down the main street, and the traffic did its best to avoid us. There was no road rage at least, always a good sign. With the map committed to memory, we were out the front of our small hotel, “The Bedroom Place,” on one of the back streets in no time at all. Shazz had emailed them ahead of time to ensure we could secure the bikes and the young staff didn’t have a problem letting us keep Sakura and Radmilla with us in the room. The deep shade of purple dominating the decor was a little confronting after a long day in the saddle. But with wifi, air con, and a comfy bed for about 25 € it ticked all the boxes. Radmilla, still fully loaded outside our hostel in Ruse. We cleaned up and went for a walk. It was early evening, and we were hungry after our first long ride for a while. The weather was balmy, and families sat in their front yards drinking, eating and laughing. It had a nice vibe to it. Thankfully the archaic ATM we found worked with our card. It’s always a little nerve wracking when you get to a new country, especially if it’s not a major city. With a pocketful of Bulgarian Lev, we parked ourselves in a covered terrace restaurant for a well-earned meal and an icy cold Bulgarian beer. The young waiter spoke little English, and neither did anyone else, so we took a stab at the menu and managed to order a pretty decent pizza, something of a staple here in Eastern Europe. By the next day, after a lot of research on the road ahead, we decided to stay one more night and try to put the bikes on a bus to avoid the dodgy mountainous road up to Sophia. We figured we’d save some time, plenty of effort, and possibly our lives! We still weren’t quite convinced we had the legs to tackle continuous steep inclines in busy traffic, and it looked as though we would have to detour through the mountains to avoid a major freeway. A four to five-day ride translated into a 4-hour bus ride for 15 € each. Once again, it seemed the smart thing to do. At the bus station, we were told it would “probably” be OK to load the bikes under the bus, and they sold us some tickets. Happy we had our onward journey sorted we headed off to explore. 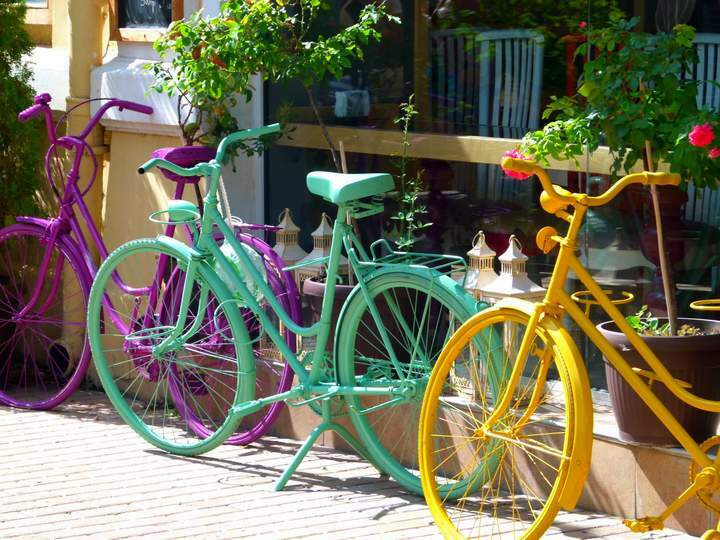 We literally knew nothing about the city as we don’t carry guide books on the bikes, (too heavy). So were a bit surprised when we stumbled upon the long, wide pedestrianized streets of Ruse’s historical center. First stop was the tourist information office where they had good maps and plenty of helpful reading material. Second stop was a delicious Bulgarian set lunch and a beer for about 4 Euro each. At those prices, Bulgaria was looking good! To our surprise, there were busloads of tourists “clicking” their way around all the sites. For a place we’d been told was ordinary, it was doing a pretty good job of being extraordinary. The huge central square was delightful with fountains, statues, and lots of green space where you could avoid the blazing sun. Flowers bloomed everywhere adding waves of color to the scene. The narrow, tree-lined streets in the center opened onto parklands crisscrossed with numerous bike paths. The many park benches were occupied by elderly residents and gooey-eyed young lovers, enjoying the brilliant weather. 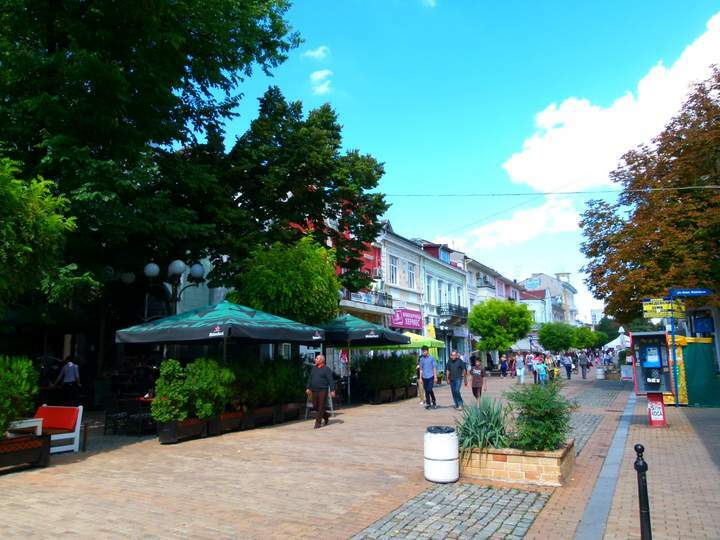 The long, attractive walking street in downtown Ruse on a glorious day. Although we’d done no research on Ruse, as we were originally only going to stay one night, it wasn’t what we had expected in rural Bulgaria. An added bonus for us, and the trip and another place we can happily recommend. 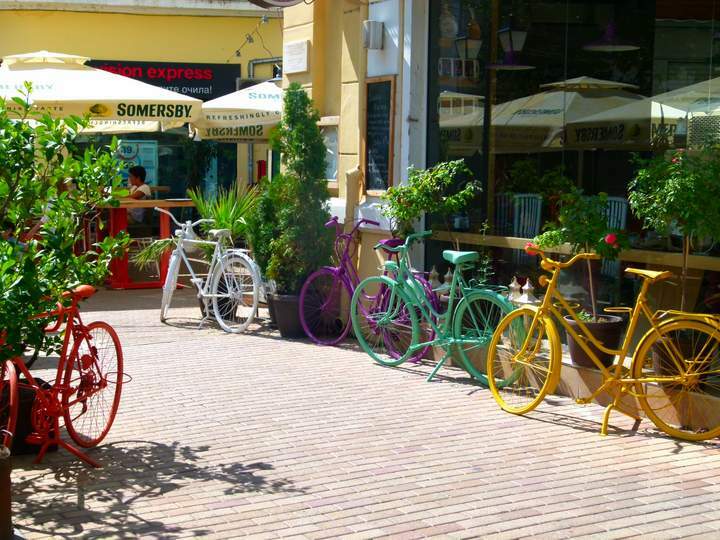 Ruse is a very bicycle-friendly town! At the bus station the next day, it didn’t take tooooo long to convince the bus driver that if we removed the front wheels and turned the bikes upside down, they wouldn’t take much room under the bus. Besides, we’d already paid for tickets. A technique that would prove the key to our success as we headed onto more adventures in the Balkans. It’s hard for the driver to say no when you’re waving a ticket at him and feign utter dejection if they start to protest.